In honor of Hispanic Heritage Month, Meriam Library will be hosting a Wikipedia Edit-a-thon. We all use Wikipedia. Instead of only consuming the content on Wikipedia, an Edit-a-thon is a dedicated space where students are encouraged to update and improve Wikipedia. At an edit-a-thon, students will learn to add citations, link pages, and improve the content on Wikipedia, by upholding the 5 Pillars of Wikipedia. It is well recognized, that articles on Wikipedia are skewed by a lack of diversity in editors. Meriam Library is going to do our part to counter systemic bias and improve Wikipedia. 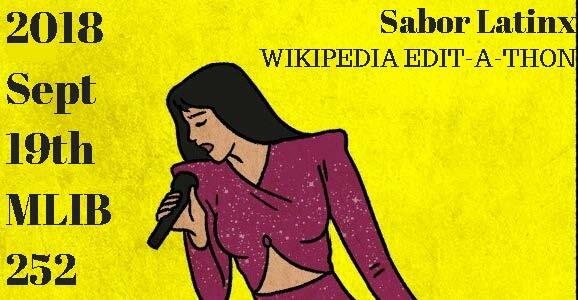 To honor the theme of Hispanic Heritage Month, we will gather to update and edit Wikipedia pages about Latinx music and musicians. This is a gathering for anyone: seasoned contributors and newbies who want to learn. Anyone can contribute, no Wikipedia editing experience is necessary; tutoring will be provided for Wikipedia newcomers as needed. Reference materials and computers will be available for use. If you are unfamiliar with Wikipedia, you can create a user profile and get a head start with this training module. If you can, please familiarize yourself with the WikiProject Countering systemic bias; please refer to Wikipedia: Five pillars. Or! Just show up and we can help get you started!